What with testing pens and one thing or another, I get through a lot of ink, but this should keep me going for a while! 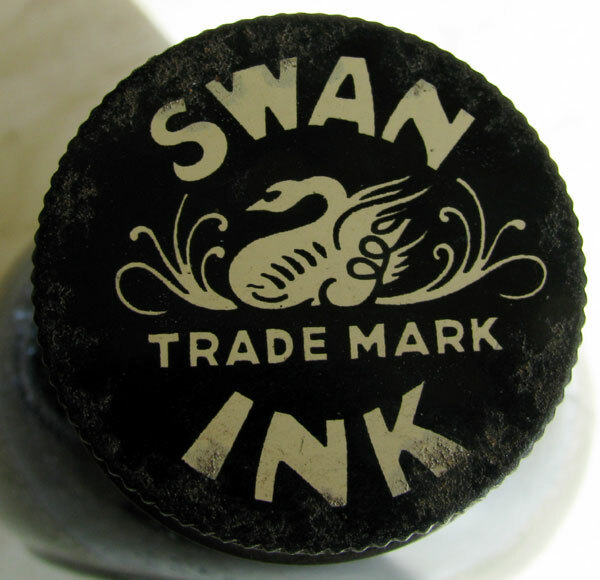 I was amazed to see full, unopened bottles of Swan ink for sale in eBay. 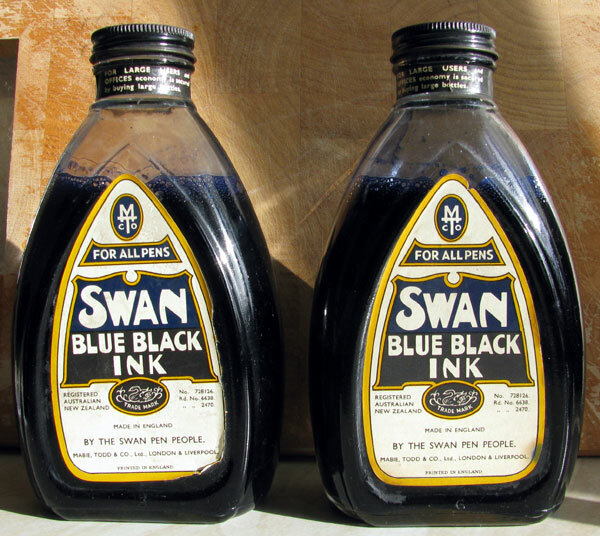 So far as I remember, Swan went out of business around 1956, so these bottles are at least 54 years old. Maybe more. There appears to have been a little evaporation, but the ink is still in perfect condition. The bottles are nine and a half inches high and must hold best part of a pint of ink. One bottle will be kept unopened, but I’ll use the other. I don’t think I’ll need to buy any more ink. Ever. These are wonderful Mabie Todd memorabilia and as Swans are my favourite pens, it will be good to write with both Swan pen and ink. These are still on sale in eBay, so if you are interested, search for Item 260741407084 on the UK site. Now I am confused. I understand from the experts to throw away ink more than one year old. Yes , I know this may be a marketing ploy but some of these experts have no such reason to say so and are truely conversant with all aspects of pencraft. [I have several old bottles which I was just about to bin after reading a book recently, by a well known pen repairer , stating the same thing. ] Which is it to be ? Yes, I’ve heard that too, and I take it with a large pinch of salt. 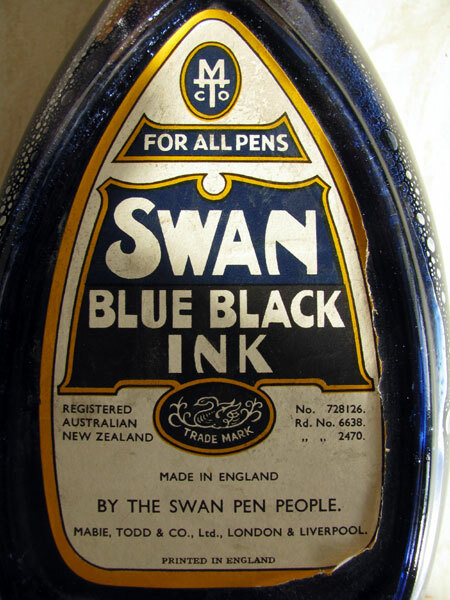 I have Diamine, Swan, Parker Quink, Stephens and Collier’s inks, all more than forty years old, some possibly more than fifty years old, all in excellent condition and used daily. I’ve used some of those old inks (in large office-size bottles) for years with no ill effects. Of course not all inks are the same and it may be that there are some that do not keep so well. I have seen some inks that have settled out, with a large amount of sediment in the bottom and that was no good. Some inks – but mostly the newer ones I believe – are prone to fungal growths but I’ve never had that. All I can say, from my own experience, is that many inks are not adversely affected by the passage of time if kept in a closed container. It may be that the repairer whose book you have read has his reasons for saying what he does, but without evidential back-up such assertions aren’t worth much. There is no single rule for whether or not to use old ink. Try it and see. If you have concerns, try it with a less valuable pen. PS There are many enthusiasts but very few experts. Maybe none. I’m certainly no expert, but I do have several decades of experience. Many thanks. I shall be guided by your advice.